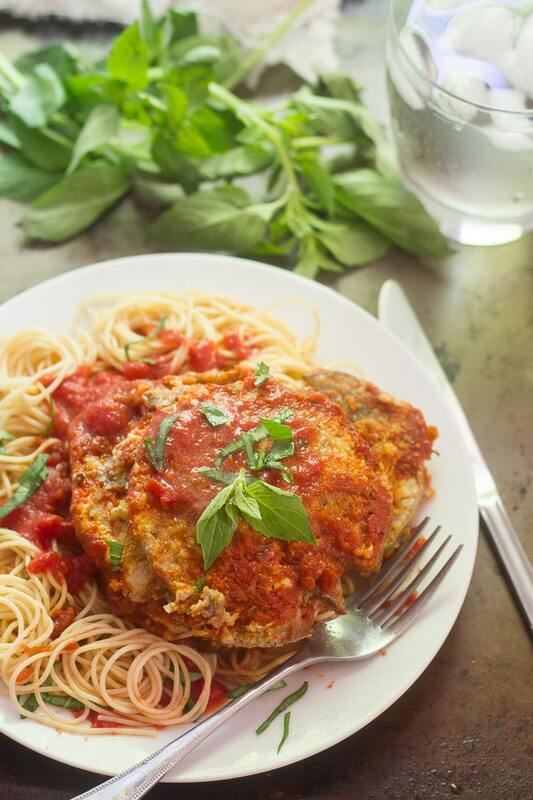 This mouthwatering vegan eggplant Parmesan is made with layers of crispy pan-fried eggplant, cashew mozzarella cheese, and marinara sauce, baked up to bubbly perfection. I think I got a couple of bonus eggplant plants in my garden this year. At first I thought they were weeds, but they looked a little familiar, so I decided to let them be for a while. They grew a bit and I started to think maybe they were eggplants, and then just the other day I popped out to have a look, and guess what? Both have little purple blossoms! Obviously the eggplant for this recipe didn’t come from my plants — I’m still just 90% sure they’re even eggplants. 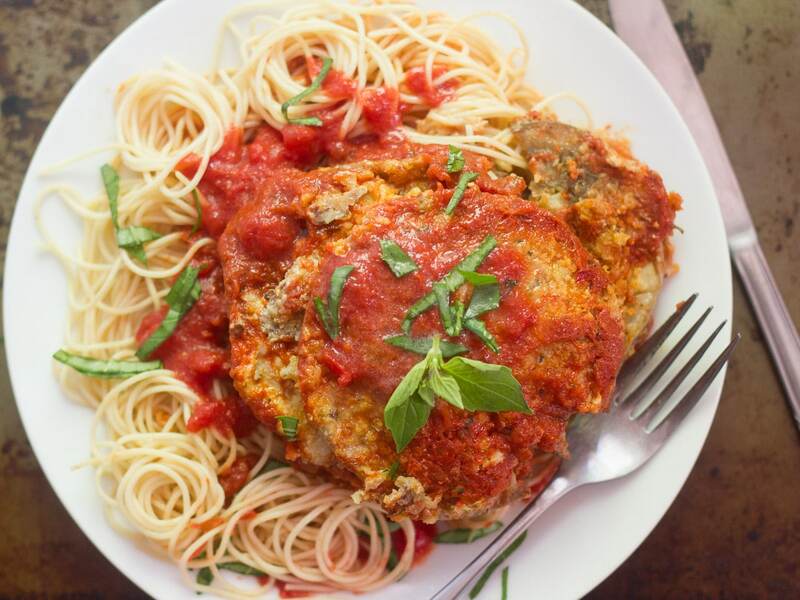 And when I made that determination I already had a couple of big fat Sicilian eggplants stashed in the fridge, so I decided to go and celebrate with some vegan eggplant Parmesan. I’ve made vegan eggplant parm before, but this is the first time I included something to stand in for mozzarella. Usually I’m content with some breaded eggplant and sauce, maybe a little cashew Parmesan sprinkled on top. But I hadn’t made eggplant parm since I came up with the recipe for this deep dish pizza, which is what got me to rethink the whole thing. 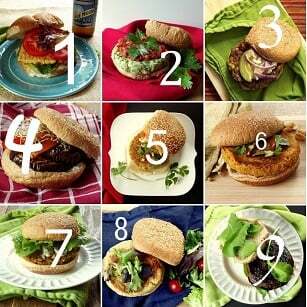 See, I’m usually all about keeping it simple when it comes to recipes that include vegan cheese. Spreadable cheeses are where it’s at, and anything else is unnecessary work and hit or miss as far as results. And lots of times the best course of action is to just skip the cheese altogether. But the pizza taught me that when you smother vegan mozzarella in layers of sauce and veggies, it’s really pretty indistinguishable from the regular old mozzarella I grew up eating, and definitely worth the effort. The mozzarella did the trick! 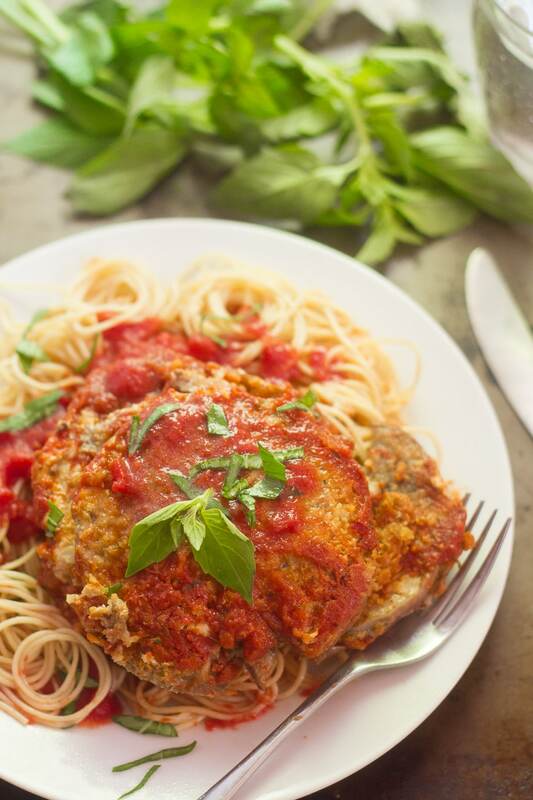 This vegan eggplant Parmesan was my all time favorite. 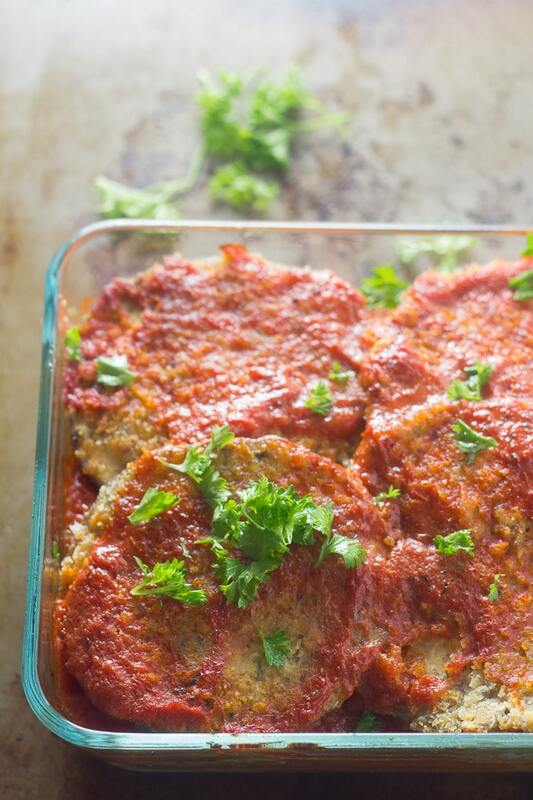 Like regular old eggplant parm, it’s a bit of a project, but totally worth it. 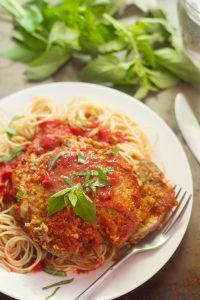 To me, this tasted like the eggplant Parmesan I grew up eating, and that’s a high bar, because as a vegetarian kiddo, eggplant parm was probably my number one all-time favorite comfort food. 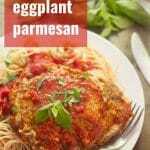 Now this vegan eggplant parm is a new favorite! If your eggplant is more than a few days old or shows browning when you cut it open, consider salting it. Arrange the slices on a baking tray and sprinkle them generously with salt. Let them sit for 30 minutes, then rinse well and pat dry. Proceed with the recipe. Feel free to use store-bought vegan mozzarella for a quicker and easier version of this dish. Look for miso paste in your supermarket’s international foods section. If you can’t find it there, try an Asian market or Amazon (link in recipe!). Place all ingredients into a blender or food processor bowl and blend until smooth. Transfer the mixture to a small saucepan and set over medium heat. Bring the mixture to a simmer, while whisking constantly. Continue to whisk until the mixture becomes thick and pulls away from the sides of the pan, about 5-7 minutes. Remove from heat and set aside. Whisk all ingredients together in a shallow dish. Stir all ingredients together in a shallow dish. Generously coat the bottom of a large skillet with olive oil (2 to 3 tablespoons) and place it over medium heat. Grab an eggplant slice and dip each side into the batter to coat, then into the panko mixture. Place the slice into the hot skillet. Repeat with additional slices, placing as many as will fit into the skillet without crowding. Cook for 4-5 minutes, until browned on the bottoms, gently flip, and cook another 4-5 minutes on the opposite sides. Transfer the slices to a paper towel-lined plate. Add oil to the skillet as needed, and repeat until all of the eggplant slices are used, working in as many batches as is needed. Ladle about 1 cup of sauce onto the bottom of a 9 x 13 inch baking dish. Arrange a third of the eggplant slices over the sauce. Grab a chunk of about 2 tablespoons of the cashew mozzarella and roll it into a ball in your hands, then flatten it. Place the mozzarella over one of the eggplant slices. Repeat, covering each of the slices and using about half of the mozzarella. Ladle about a cup of sauce over the mozzarella coated slices. Repeat the layering arrangement once, then top with the remaining eggplant slices and a layer of sauce. Place the dish into the oven and bake, uncovered, until bubbly, 25-30 minutes. Remove the dish from the oven and allow it to sit for 5-10 minutes before cutting. Divide onto plates and sprinkle with basil, parsley, and cashew Parmesan, if you like. Serve. Wow! This was absolutely deicious!! I already had sauce made and cashew mozzarella that I’d made for pizza, so it was pretty easy to make. I just had leftovers for lunch and it tasted just as good. Another hit Alissa! I can’t wait to make (eat) it again! I made this. It’s great. I have one question regarding the “cashew parmesan” that is optional. Which are the ingredients for it? Is this the same as the cashew mozzarella? I’m confused. And it is optional! I’m glad you enjoyed this! !